It’s not uncommon for me to hear the lament that someone (usually the person lamenting) has too much responsibility. On closer examination, however, I frequently find what’s really happened: They have been given too little authority. Their responsibility level is appropriate, they just have too little authority to get the job done. In most of these cases, it’s management malpractice—the manager hasn’t delegated sufficient authority to go with the responsibility. 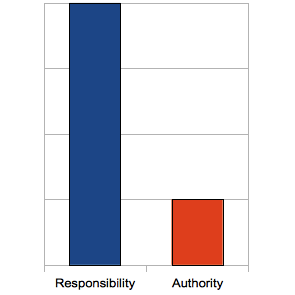 This imbalance is sometimes seen in situations with immature managers afraid to delegate and let go of that authority. In other situations, the manager just isn’t very good at delegation. It can take practice to delegate the appropriate authority along with that responsibility. Ask your people what they need to get it done. Do you have access to the right resources? Do we need to discuss this at a team meeting to ensure everyone’s cooperation with you? Does another manager or team need to know about this assignment? Do you need additional access or to request extra permissions? Are you in the right place in the organization to tackle this project? DeMarco and Lister touch on this subject in Peopleware when they pair autonomy and responsibility in the “Open Kimono” chapter. You, the manager, have already given this task to the right person and given them the responsibility to get it done. Coupled with that should be the authority needed for success. And full delegation of responsibility and authority becomes a lot easier when management trusts its people to do the right thing. Why more managers don’t trust the people who work for them is difficult for me to understand. You’ve hired them (or decided to keep them)—why employ someone you don’t or can’t trust? Give them the authority to match the responsibility you assigned! Don’t set your people up to fail. Because when they fail, you fail. But when they succeed, they succeed. Yes, that’s correct: when your people succeed at something you’ve delegated, they succeed; they get the credit and the glory. After all, they did the work, they took the responsibility and authority and made something happen. Failure does happen, but less often than you’d think. It’s heady and a little frightening to know that the boss has put part of his or her reputation into the subordinates’ hands. It brings out the best in everyone. […] They’re not just getting a job done. They’re making sure that the trust that’s been placed in them is rewarded. DeMarco and Lister were writing about teams but the same can be said for individuals. The person you delegated to is “making sure that the trust that’s been place in them is rewarded.” They’re not likely to let you down. And so what if failure does happen? Well, you own that. You made the assignment, you chose the person. You’ll still want to have that hard conversation with your employee, but you own this one, this failure. It’ll just happen a lot less frequently than you think. Now what? Review your project portfolio and ensure that the right person is assigned to each project or task. Tweak those that need it. Clarify the responsibilities during your next one-on-one.2 Ask if any additional authority is warranted. Increase it where necessary. Get that balance. Readers, what do you think? 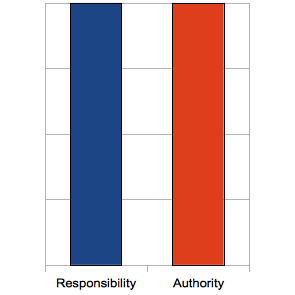 Have you ever created a responsibility/authority imbalance in someone’s workload? How did you resolve it? Have you ever personally been hamstrung with too little authority? What was the result? 1 And anyway, isn’t this the kind of credit you want? After all, you were likely chosen for this role not to do the work but for the knack of seeing it done. 2 You are having regular one-on-one meetings with all your people, aren’t you? This entry was posted in Management and tagged authority, management, Peopleware, responsibility, trust. Bookmark the permalink.